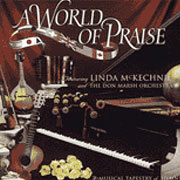 Linda McKechnie has made a name for herself with the wonderful Symphony of Praise and Hymnworks projects. A World of Praise, is a collection of hymns from around the world that uses orchestration and instruments native to each region. It’s energetic and entertaining, while breathing new life into well-known classics such as Amazing Grace and Come Thou Almighty King. Just try not to get goose bumps as the Morning Has Broken/Immortal, Invisible medley swells from ethereal children’s voices into resounding trumpets and then ends on a crescendo. One standout number is Siyahamba/Kum ba Yah from South Africa, featuring the African Children’s Choir. With the success of instrumentalists Dino, Yanni and John Tesh, it’s nice to see a woman get a well-deserved shot at the same listener audience. A World of Praise celebrates the God of all nations with melodies in styles as diverse as South African and Gaelic. Diversity abounds on this album, from the instruments (grand piano, full orchestra, Irish flute, bagpipes, mandolin, steel drums, African drums, brass band, and accordion) to the songs (including an Italian hymn, a Spanish folk melody, Caribbean stylings, a Swahili tune, and Scottish melodies). Pianist Linda McKechnie, a "late-bloomer" who began her professional career in Christian music in her forties, is the uniting factor amongst all these diverse sounds. Linda'’ personal note is as inspiring as the album: "There is no distinction between ethnic backgrounds or denominations when we praise God. Christ'’s love is for everyone." 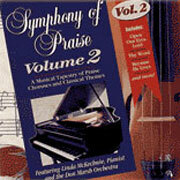 Symphony of Praise I, from Brentwood Music, is a wonderful contemporary mix of praise choruses with classical themes. It may sound a bit strange, but it really works. These are not praise songs set in a classical style, but a classical theme mixed in with "classic" praise choruses of today. Featuring Linda McKechnie on the piano and the Don Marsh Orchestra, these arrangements create a wonderful mood for personal worship. The music of Copeland, Pachelbel, Mozart, Chopin, and others blend together to create a new sound experience for all ages and musical tastes. Imagine the power of Majesty blended with Concerto in A Minor by Grieg, or All Hail the Power with Purcell’s Trumpet Voluntary. Of special note are As the Deer combined with The Swan by Saint-Saens and Glorify the Name with Chopin’s Etude. McKechnie and Marsh have already given us the popular Hymnworks series from Brentwood, and now Symphony of Praise I continues their wonderful collaboration. 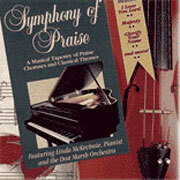 Symphony of Praise I is a unique and musically outstanding collection of popular praise and worship choruses combined with some of the great songs from such classical composers as Copeland, Chopin, Mozart and Grieg. The result is an extremely listenable instrumental experience that moves you to new levels of praise, as well as shedding new light on some familiar classics. 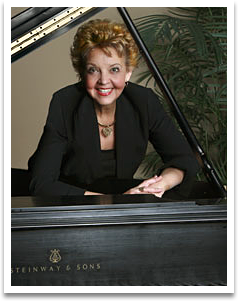 Pianist Linda McKechnie turns in first-rate piano performances and is responsible for all arrangements. Her brother, Don Marsh, produced and orchestrated the project. Highlights combine Majesty with Concerto in A Minor by Grieg, How Majestic Is Your Name with Alleluja by Mozart and Seek Ye First with Canon in D by Pachelbe. Remember that commercial where that guy dropped his chocolate into the girl’s peanut butter and they suddenly discovered a new candy treat? Well, take the same formula, but instead, throw together some well-known praise songs with song even more well-known classical orchestrations, and you come up with a somewhat new musical treat. Symphony of Praise II is a continuation of the best-selling first album by pianist Linda McKechnie and the Don Marsh (her brother) Orchestra. It’s a first-class listening experience that appeals to lovers of the classics who are also looking for a new worship experience. Volume 2 features such combinations as Bill Gaither’s Because He Lives with Tschaikovsky’s 1812 Overture, O Worship the King with Wagner’s Lohengrin and I Exalt Thee with Chopin’s Polonaise. It’s a highly entertaining and inspiring combination of musical genres.